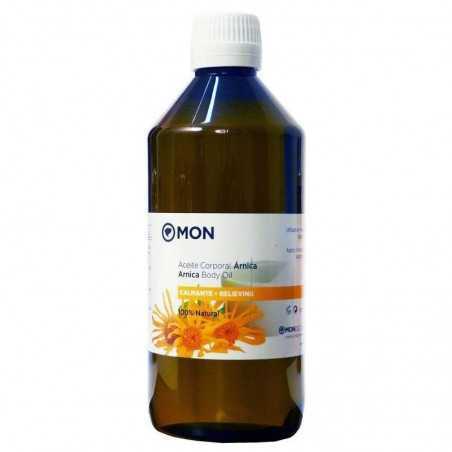 Arnica Body Oil Mon Deconatur. Natural body oil that relieves pain and acts as analgesic and muscle relaxant. Natural body oil that relieves pain and acts as analgesic and muscle relaxant. Its application helps to mitigate localized pain thanks to its composition in essential anti-inflammatory and myorelaxant oils. Breathe the scent of the most comforting and anti-inflammatory essential oils in combination with the Arnica Montana flower extract. Made with Arnica Montana in an almond oil base and essential oils of Manzanilla (soothing), marjoram (relaxing), juniper and grapefruit (drainage) and Ecological Hypericum. A masterful formula to improve mood and relieve muscle. Pour in a hot bath or directly on the skin in the form of a massage to feel that the storm disappears. Prunus Amygdalus Dulcis Oil, Origanum Majorana Oil, Limonene, Arnica Montana Extract, Helianthus Annuus Seed Oil, Hypericum Perforatum *, Citrus Paradisi Peel Oil, Multicaulis Ormenis Oil, Fruit Oil Juniperus Communis, Linalol. * Ingredients from organic farming.